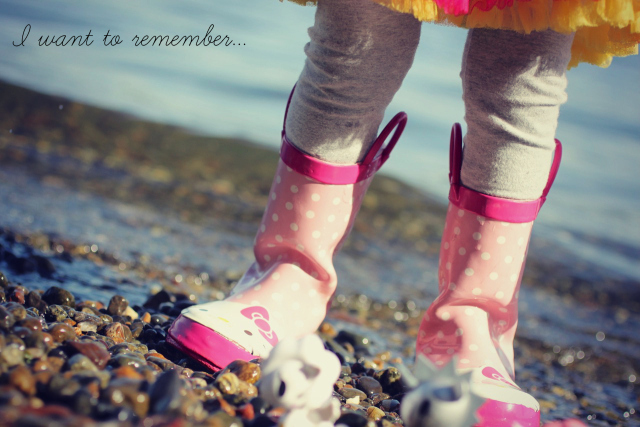 I want to remember how excited you are to wear your rainboots so you can walk in the water and explore. I want to remember that you asked about Millie's family and listened thoughtfully as I explained I didn't know her dog family but that Daddy and I rescued Millie from a human family that didn't want her anymore for reasons we don't know or understand. We talked about how much we love her and are glad that she's part of our family. I want to remember the moments when I realized you know almost every word to the first stanza of Adele's "Rolling in the Deep" and just about every word of Of Monsters and Men's "Little Talks." I want to remember how your little voice was singing along with such joy as you painted. I want to remember how much you love Grandma Fina's pasta sauce and often remind me that it is the best pasta sauce in the whole wide world. I want to remember the way you talk to the little babies at school and how you gently touch them and say, "Good morning." I want to remember the excitement you had on your face when you said, "Come on Mama and Daddy, be in a band with me!" And we got out all the instruments and played and drummed and sang and you were definitely in charge. I want to remember how much you love making chili. I want to remember how I found you in child's pose in your room after you'd stomped down the hall so mad because I said "no." I want to remember that I'm trusting my intuition when it comes to so many things and modeling this for you is one of my most important moves as your mama. I want to remember the moments when you wrap your arms around my arm as you cuddle up with me on the couch and say, "Mama, mama, mama, mama, mama, mama, I love you." "I want to remember..." is one of my favorite prompts to use here on my blog, in Project Life, and when I'm stuck (or when I think I don't have any stories left). Each statement becomes it's own access point to a story I want to tell. And, so often I find threads of gratitude woven within the memories. An invitation :: Get out a pen and paper and write your own list today. You might even want to leave a comment sharing an "I want to remember" story. This November, I'm exploring the idea of saying YES to gratitude in all its gorgeous, sometimes confusing, heart-expanding ways. And I'm inviting you to come along on the adventure here on my blog. Throughout the month, there will be a practice in letting others know I'm grateful for them, a few stories, a collaboration or two, inspiration from others, some giveaways, a special Etsy sale for my newsletter subscribers, and a few other good things. You can find all the YES to Gratitude posts right here.